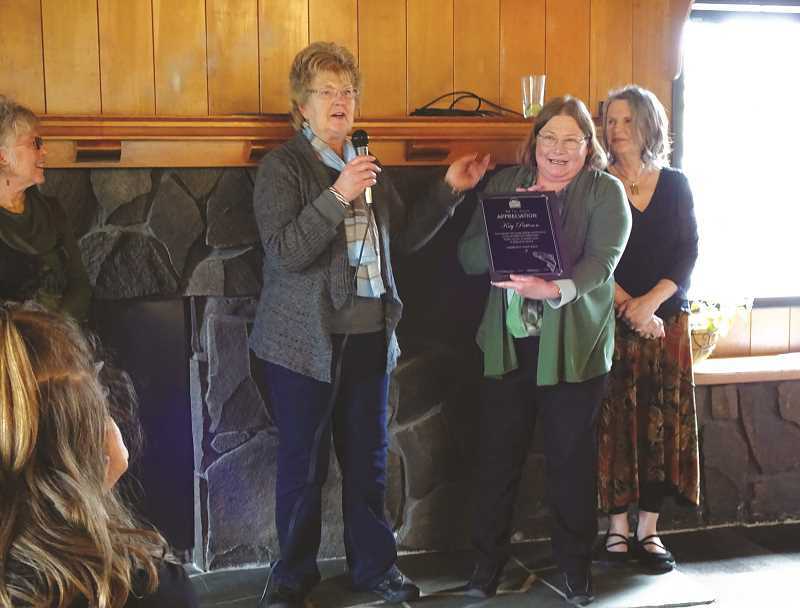 Molalla River Watch Executive Director Kay Patteson has retired after helping with restoration efforts in the Molalla River Corridor for 25 years. After 25 years of service with Molalla River Watch, the region's official Watershed Council, Kay Patteson has decided to retire. "The Molalla River Watch mission is to preserve, protect and restore the Molalla River Watershed through education, conservation and restoration for future generations," Patteson said. "I originally got involved with Molalla River Watch because I do love to fish. The decline of fishing was quite evident in the early 90's, and I wanted to see what I could do to improve fish habitat." Patteson began her tenure as the group's executive director in 1992, when MRW was officially granted nonprofit status, allowing the organization to receive funding from major state and federal agencies, including the Bureau of Land Management and the Oregon Department of Fish and Wildlife. "Twice a year we have a river clean-up, and most of the time you will find quite a bit of garbage," she said. "For years, the area was looked at as the county dump. "The Molalla River Corridor became our main focus because it had just been recently acquired by the Bureau of Land management, and we developed a wonderful partnership with the BLM to care-take this area." Patteson has lived in Molalla since 1971 and has always been an avid angler, which she said is what inspired her to become involved with the group. "After a while, I wanted to give back to something I enjoyed so much," Patteson said. "I got more and more involved with the [MRW], so I spent my afternoons working with people and figuring out that we could improve the area and grow fish habitats." After Oregon's BLM took ownership of the land, which consists of about 6,000 acres in the Molalla River Recreation Corridor, it coordinated efforts with state and local organizations such as the MRW to provide sustainability endeavors. Patteson has been there since the beginning and has seen it all. She said the reduction in the amount of garbage throughout the corridor is one of the most significant accomplishments she has helped orchestrate — last weekend's Molalla River Cleanup was her 49th. She said part of that is persistence, because the MRW has continually cleaned up on a regular basis two times per year with volunteers, and provided awareness for other people to be picking up trash along the way too. "So all in all, the reduction in the amount of trash has been huge – it's something I'm very proud of," she said. Patteson said the clean-up efforts originally required two 30-yard drop-boxes, one completely filled with metal and the other filled with random trash. She said in the early years, some of the debris they collected had been lying in the corridor for years, even decades. She recalled a particular early cleanup in which 91 tires were pulled out of different areas along the river. The annual cleanup events have provided local residents and visiting recreationists some of the most beautiful, clean, and safe environments to utilize and admire, Patteson said. She is also proud of the MRW being recognized by the Oregon Watershed Enhancement Board in 2009 as the Molalla River Watershed Council. "That gave us the opportunity to get funding from OWEB," Patteson said. And that funding allows the MRW to coordinate more than their biannual cleanup events. They also provide educa-tional opportunities like the upcoming field trip to Aquila Vista, a thriving egg hatchery for northern red-legged frogs; trail development, improvement and maintenance; tree planting, stream side restoration and fish habitat enhancement projects; stream and habitat surveys; and community education through cultural history and geology presentations. Since the 1990s, Patteson and the MRW have worked with Molalla middle school students and youth organizations, planting trees and native foliage in the corridor. Over the years, especially in the past four years, their work has helped restore the corridor, which now boasts new BLM campsites with restrooms and 50 miles of trail systems for hikers, equestrians and mountain bik-ers. Patteson and the MRW brought in volunteers to help build the trails and campgrounds, as well as create the reforested areas. "Hopefully we will be able to leave this area totally natural, and watch the changes that occur," she said. "The wildlife use in this area is fantastic. And it's great to lead students around, and work with them, so they get the benefit of surveying wildlife in the area." She and the MRW have also worked with the Oregon Department of Fish and Wildlife to clear obstructions in the river, making it possible for native fish to go upstream. "I've personally been involved with two fish passage barrier removals," she said. "And then numerous smaller projects, one that a fellow had to drive through a side channel to get to the majority of his property, and we were able to get funding to help him put in a bridge so he didn't have to drive through the water." "We can provide the funding to individual landowners that want to do something on their own properties," she said. Noting that the Molalla River serves as the drinking water source for the cities of Molalla and Canby, she said "It is super important to keep the river as clean as possible, and we've worked with DEQ on restoration work along the edges of the river so there isn't as much sediment going into the river." Aside from organized cleanup events, Patteson said individuals and families can make their own efforts to keep the area clean. The main way to do that is to pick up your trash and to leave the area cleaner than it was when you used it. Patteson also said it's important to stay on the designated trailheads and not veer off because it protects the environment and animal habitats. As for her favorite part of the job over the years, Patteson had an answer right away: getting to know people in her local community. "They are so enthusiastic about protecting and taking care of the Molalla River from a recreation standpoint, from a fishing standpoint, from a water quality standpoint," she said. "I get the most enjoyment out of talking with people, learning their stories why they come out and volunteer." Now that she's retired, Patteson said she'll be helping with the transition process part-time for the next couple of months, and then she plans to take on some projects of her own around her home.